Sharpen your pencils and get your notebooks ready! 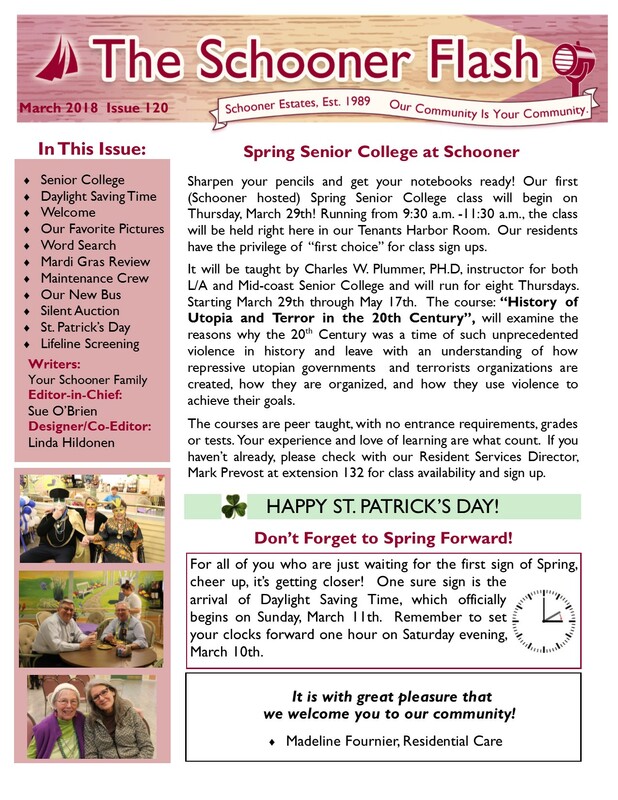 Our first (Schooner hosted) Spring Senior College class will begin on Thursday, March 29th! Running from 9:30 a.m. -11:30 a.m., the class will be held right here in our Tenants Harbor Room. Our residents have the privilege of “first choice” for class sign ups. It will be taught by Charles W. Plummer, PH.D, instructor for both L/A and Mid-coast Senior College and will run for eight Thursdays. Starting March 29th through May 17th. The course: “History of Utopia and Terror in the 20th Century”, will examine the reasons why the 20th Century was a time of such unprecedented violence in history and leave with an understanding of how repressive utopian governments and terrorists organizations are created, how they are organized, and how they use violence to achieve their goals. The courses are peer taught, with no entrance requirements, grades or tests. Your experience and love of learning are what count. If you haven’t already, please check with our Resident Services Director, Mark Prevost at extension 132 for class availability and sign up. Don’t Forget to Spring Forward! For all of you who are just waiting for the first sign of Spring, cheer up, it’s getting closer! One sure sign is the arrival of Daylight Saving Time, which officially begins on Sunday, March 11th. Remember to set your clocks forward one hour on Saturday evening, March 10th. It is with great pleasure that we welcome you to our community! Another Schooner style Mardi Gras has come and gone. We all had a great time! As usual, the New Orleans style buffet lunch, prepared by Chef Seth Lyons and his amazing culinary crew, was wonderful. And last but not least, the always popular Mardi Gras parade rounded out the day. 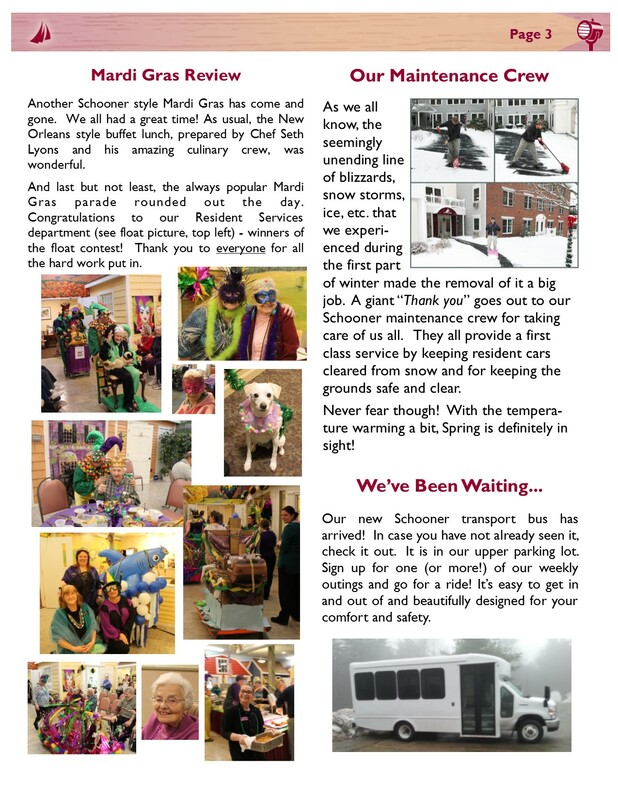 Congratulations to our Resident Services department (see float picture, top left) – winners of the float contest! Thank you to everyone for all the hard work put in. As we all know, the seemingly unending line of blizzards, snow storms, ice, etc. that we experienced during the first part of winter made the removal of it a big job. A giant “Thank you” goes out to our Schooner maintenance crew for taking care of us all. They all provide a first class service by keeping resident cars cleared from snow and for keeping the grounds safe and clear. Never fear though! With the temperature warming a bit, Spring is definitely in sight! Our new Schooner transport bus has arrived! In case you have not already seen it, check it out. It is in our upper parking lot. Sign up for one (or more!) of our weekly outings and go for a ride! It’s easy to get in and out of and beautifully designed for your comfort and safety. A reminder for all new comers to Schooner! Make it a point to check out our “Silent Auction.” Have you been joining in and submitting a bid or two? We have been doing this for a few years and it has worked out well. Everyone seems to enjoy it! 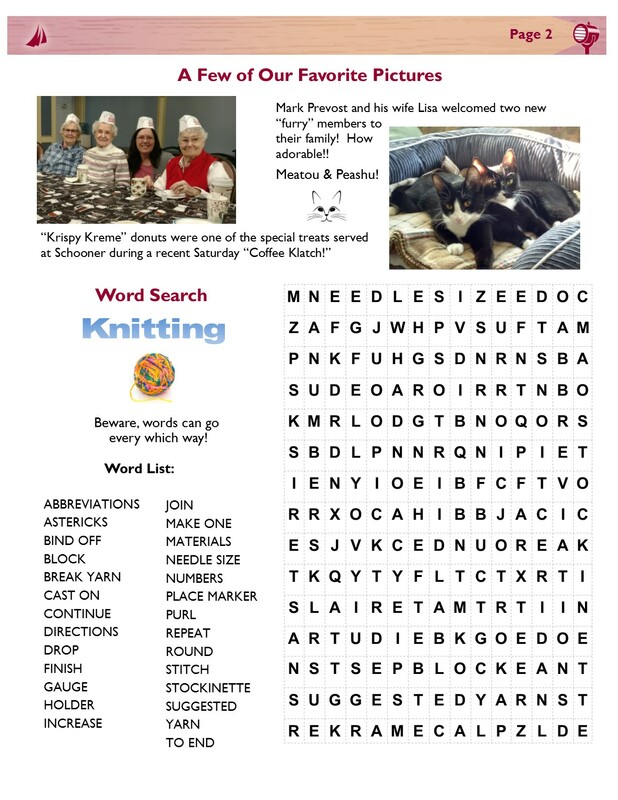 Items are posted weekly by the Camden coffee bar, Camden entry way and the front desk area in the Castine building. Items are on display in the Tenants Harbor Room. Bids are chosen each Thursday at noon with new items posted the same day. It’s fun and easy to do! The bid box is located near the front desk right outside the Village Green. Also, be sure you put the date and time of your bid on the bidding slip, as this becomes the tie-breaker, the earliest of a tie bid wins! St. Patrick’s Day occurs annually on March 17 in observance of the death of St. Patrick, the patron saint of Ireland. What began as a religious feast day in the 17th century has evolved into a variety of festivals across the globe celebrating Irish culture. On this proud Irish holiday, you’re likely to see every shade of green. Why? It’s an American tradition that harkens back to old Irish folklore. Revelers of St. Paddy’s Day believed that wearing green made you invisible to leprechauns and therefore, impervious to their mischievous pinching. Of course, green wasn’t always the iconic color of the holiday. Originally, it was blue! Green was thought to have flourished as a tribute to the Emerald Isles and inspired the color change from blue (back in the 17th century) in order to better match the Irish flag. 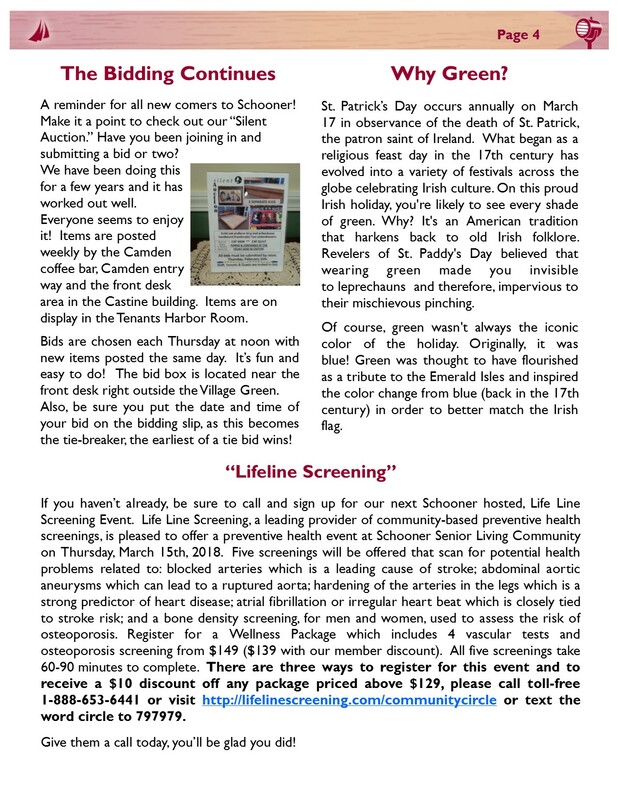 If you haven’t already, be sure to call and sign up for our next Schooner hosted, Life Line Screening Event. Life Line Screening, a leading provider of community-based preventive health screenings, is pleased to offer a preventive health event at Schooner Senior Living Community on Thursday, March 15th, 2018. Five screenings will be offered that scan for potential health problems related to: blocked arteries which is a leading cause of stroke; abdominal aortic aneurysms which can lead to a ruptured aorta; hardening of the arteries in the legs which is a strong predictor of heart disease; atrial fibrillation or irregular heart beat which is closely tied to stroke risk; and a bone density screening, for men and women, used to assess the risk of osteoporosis. Register for a Wellness Package which includes 4 vascular tests and osteoporosis screening from $149 ($139 with our member discount). All five screenings take 60-90 minutes to complete. There are three ways to register for this event and to receive a $10 discount off any package priced above $129, please call toll-free 1-888-653-6441 or visit http://lifelinescreening.com/communitycircle or text the word circle to 797979. Give them a call today, you’ll be glad you did!